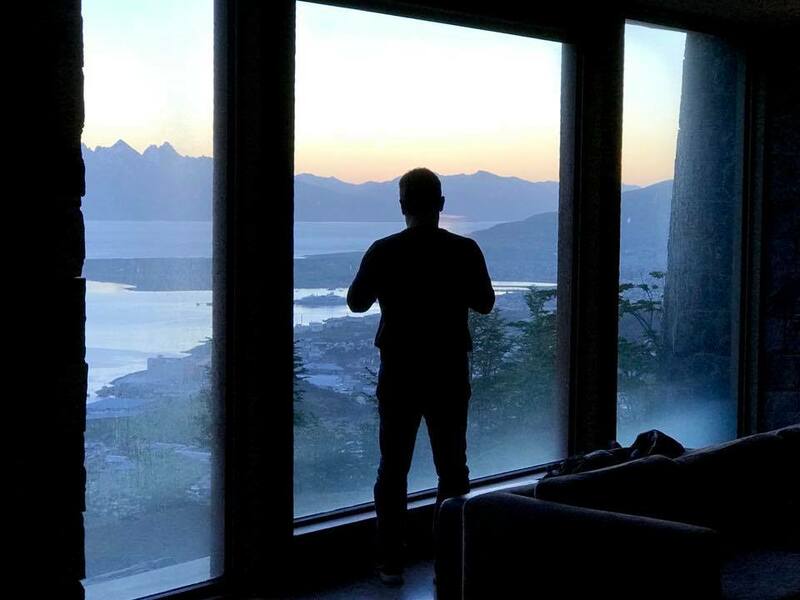 This beautiful resort is set high above the city of Ushuaia, with spectacular views of the city, the sea, and the surrounding snow capped mountains. It does not have the most appealing outer appearance, but once you enter the front doors, everything is different – just gorgeous. While the Arakur is only fifteen minutes away from downtown where you can find excellent dining and activities, the resort’s panoramic setting is set apart from the hustle and bustle, instead offering quiet relaxation in a comfortable setting. Think wood, stone, marble, leather, and comfy couches and chairs. (Photos taken with iPhone 7 plus – completely unedited). The lobby area was expansive, with many cosy spaces to visit, read, write, work, or rest. One of the highlights of the lobby areas are the views! The architect designed these areas with large floor to ceiling windows, allowing guests spectacular views of the surrounding beauty. There is also a bar and lounge area further down the hall, before you get to the spa area/stairs. The bedrooms are cozy and comfortable with warm duvet covers, soft pillows, and once again, breathtaking views of the harbor, sea, and mountains, depending on your room category. Here is a delicious welcome gift of Malbec Wine and chocolates with a view. The bathroom has a wonderful soaking tub with a large glass window looking into the room and outside. There is a shade that can be drawn for privacy. The pools and spa areas are gorgeous, with views from both inside and out. This is a perfect place to end a long day of hiking and exploring. It’s nice to have both indoor and an outdoor facilities, as it can sometimes be super windy outside. Game Room and Gym with a view. The Dining Room can be reached via an elevator or a circular set of beautiful wooden stairs descending into a small lobby. As every other area in this hotel, the dining room also has beautiful views of the sea, mountains, and the city of Ushuaia below. Take note of the pretty ceiling tiles as well. The dining room was spacious and lovely. We enjoyed sipping on our cappuccinos and topping off our massive breakfasts with scones lathered in dulce de leche and Calafate jam (see below)! The breakfast buffet was included in our package rate. Along with the delicious hot breakfast options like bacon and scrambled eggs, you could also choose from a great variety of fruits, scones, breads, pastries, and even dessert items like brownies and cheesecake. And of course every breakfast included a little Dulce de Leche (my favorite carmel like treat) and Calafate Jam (a berry similar to blueberries but red). One added surprise was also being able to order eggs made any way you liked. Did I mention they also created dulce de leche pancakes (more like crepes as we know them). We also had lunch in the resort dining room, and it was delicious. We sampled the empanadas and fresh fish. We heard from other guests, however, that the buffet dinner served in the evening was not overly impressive, but I can’t say for sure, since we didn’t experience it for ourselves. The resort offers a shuttle every hour to the downtown area, and another one every 20 minutes past the hour back to the resort. The ride takes between 12-15 minutes. Keep in mind that the section of road heading up to the resort is unpaved at the time of this writing, so you may want to keep your windows shut. Once you are downtown, almost everything – restaurants, shops, banks, etc. is walking distance. Overall, our experience here was fantastic. The service was excellent, with friendly helpful staff. I would highly recommend this resort.